Wendy 'Buffy' Rosander 1959 ~ 2007 Wendy 'Buffy' Rosander, devoted mother, loving daughter, sweet sister, and caring friend left her earthly home on Sat., April 7, 2007. She was born Jan. 26, 1959, to Paul William and Wanda Marchant Rosander. She died of natural causes from an intra-cerebral hemorrhage. Wendy spent her happy childhood and teenage years in Holladay, Utah, attending Olympus High and graduating from Murray High School in 1977. She was a member of The Church of Jesus Christ of Latter-day Saints. 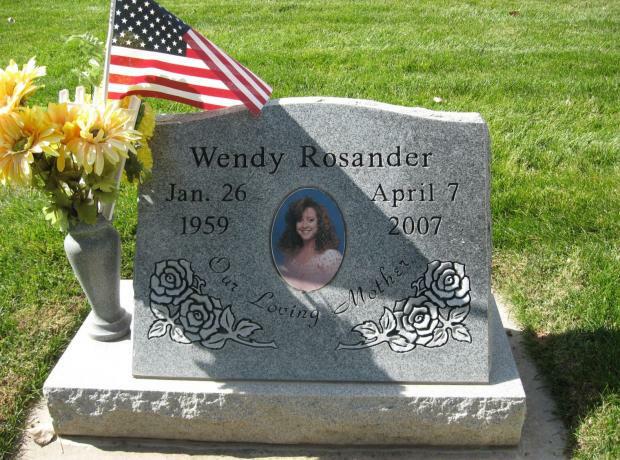 She received her cosmetology license from SLCC and a degree in sociology from the U of U. Wendy had a contagious smile and a ready laugh, but her trademark was her long, red, curly hair that was as bouncy and fun as her personality. Her greatest joy was spending time with her children, Alex (Racquel), Amber, Arlen, Ashley and Andrey Smith, whom she loved with all her heart. She also treasured being a grandmother to Thomas Smith, Bronson Renteria, and Kia Webley. Mourning Wendy, but cherishing many wonderful memories of her, are her children, grandchildren, parents and siblings: Sharon (Ray) McMullin of Layton; Becky (Clark) Nielsen, Paul (Diane) Rosander, Russ (Kathi) Rosander, Diana Hamilton of SLC; and John (Toni) Rosander of Hurricane, UT; as well as many nieces and nephews and other extended family members and friends. Memorial services will be held Fri., April 13, at 1:00 p.m. in the LDS Valley View 11th Ward Building located at 1925 E. 4101 S. (Gunderson Lane) in Holladay, with a gathering for close friends and family one hour prior to the service. Private burial.